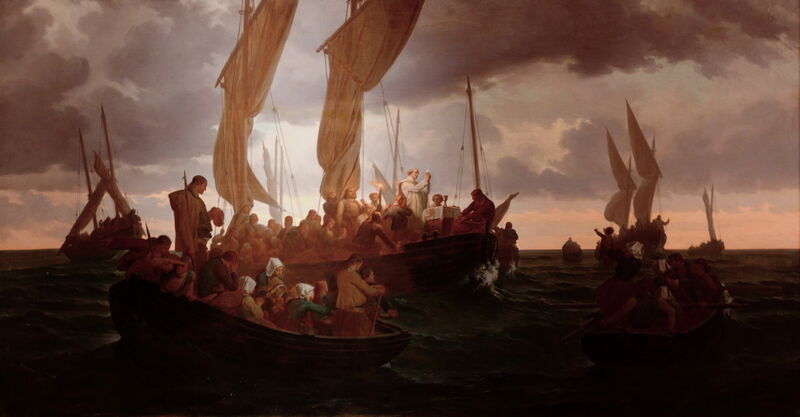 Louis Duveau (1818–1867), A Mass at Sea in 1793 (1864), media and dimensions not known, Musée des Beaux-Arts, Rennes, France. Image by Caroline Léna Becker, via Wikimedia Commons. In early December 1793, when civil war was raging in parts of France, a fourteen year-old boy, Joseph Bara, attached himself to the revolutionary Republican forces fighting a Royalist uprising in the west of the country, to the south of the River Loire. When he was leading a pair of horses he was attacked by a group of thieves who demanded that he hand the horses over. He refused, and the brigands killed him. That was the report sent by General Desmarres back to the governing National Convention in Paris. But it was seized on by Maximilien Robespierre, who praised the boy as a hero of the nation. Word went out that Bara had been cornered by Royalist forces, and ordered to shout “Long live the King!” When he responded by asserting his allegiance to the Republic instead, the Royalists murdered him in cold blood. 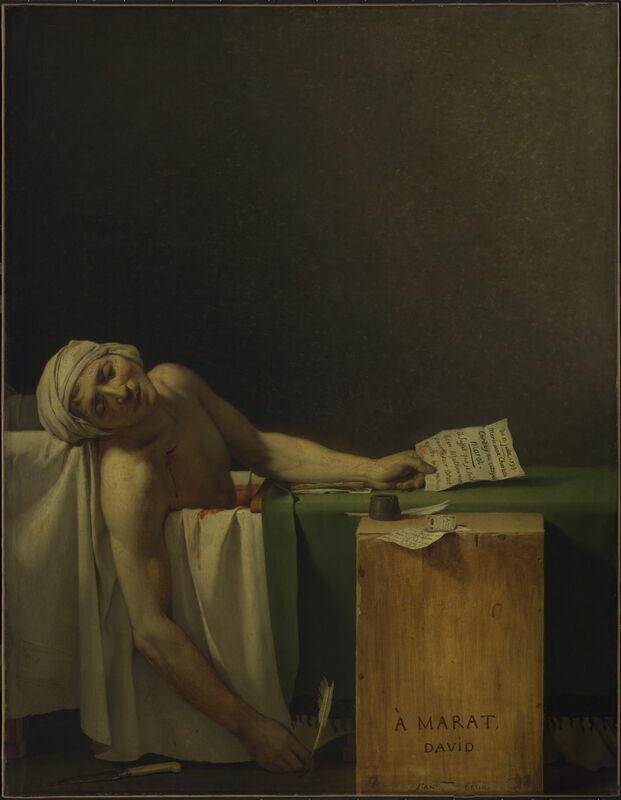 This caught the attention of the great painter and pro-revolutionary Jacques-Louis David, who had recently painted his famous work Marat Assassinated. Seeing the opportunity to portray an even more emotionally-charged episode of revolutionary valour, David set to work to paint the young Bara. Jacques-Louis David (1748–1825), The Death of Young Bara (1794), oil on canvas, 119 x 156 cm, Musée Calvet, Avignon, France. Wikimedia Commons. 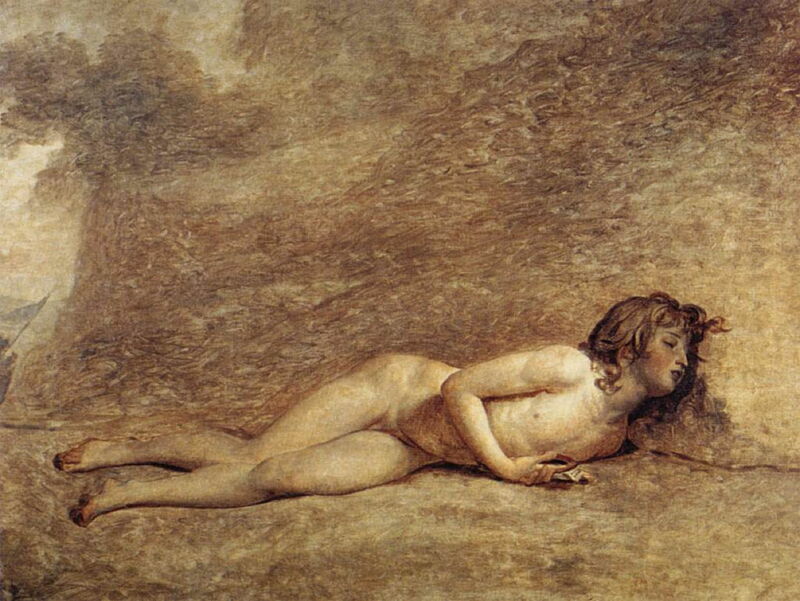 I don’t know why David never completed this painting of The Death of Young Bara (1794). One of his pupils made a copy which has also survived. Nor do I understand why Bara is shown naked, as if the victim of a horrific assault. Perhaps this painting was overtaken by events: Robespierre and perhaps David too had arranged for Bara’s body to be interred in the Panthéon in Paris during a grand revolutionary festival, but this never happened as Robespierre was overthrown the day before the planned ceremony, and swiftly guillotined in public. 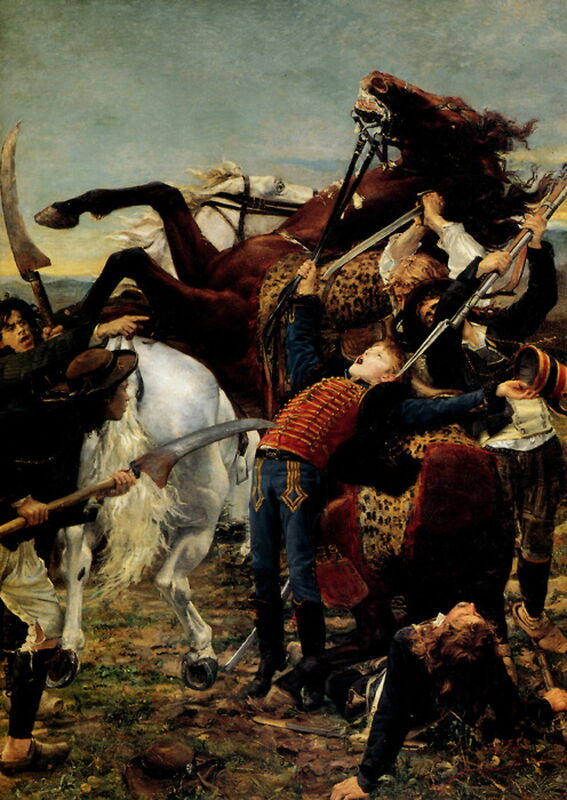 David’s unfinished painting then passed to the artist Horace Vernet, and has been largely forgotten. Bara’s death was but one small episode in a war which has remained controversial ever since, the bloody Royalist uprisings of the Vendée and Chouannerie. Most recently these have been claimed to amount to genocide. You can read detailed accounts on Wikipedia for the full story of the Vendée, which took place to the south of the River Loire between 1793-96, and Chouannerie to the north of that river from 1794-1800. The Royalists included most of the clergy, and this led to the slaughter of many innocent Catholics. In Nantes, Catholic civilians were rounded up and drowned in large numbers. At the end of 1793, Republican forces killed many other non-combatants across much of the region, and General Westerman reported back to Paris that his Republican forces had trampled their children beneath their horses’ feet, and “exterminated them all”. However, this remains very controversial today, with some claiming that half the population were slaughtered by systematic killings, others considering that deaths were little more than a hundred thousand. Either way, these horrific events were commemorated in Honoré de Balzac’s first novel, Les Chouans, published in 1829, and and a steady trickle of paintings. Jean Sorieul (1825–1871), Fighting at Quiberon in 1795 (1850), oil on canvas, 132 × 232.5 cm, Musée d’art et d’histoire de Cholet, Cholet, France. Wikimedia Commons. In 1850, the military and battlefield artist Jean Sorieul painted one of the stranger moments in the civil war in the north, in his Fighting at Quiberon in 1795. This shows a failed attempt by Royalist forces to invade the Brittany coast in Quiberon Bay in July 1795, with the assistance of the British Navy. A handful of Royalists at the left are trying to beat back Republican attacks, and allow the flight of civilians to take refuge aboard British ships, at the right. Charles Fortin (1815-1865), Chouans (1853), media and dimensions not known, Musée des Beaux Arts de Lille. Lille, France. Wikimedia Commons. In 1853, the Parisian landscape and genre painter Charles Fortin painted Royalist forces in the north in his Chouans. A Catholic priest is seen at the far right. At the time that Fortin painted this, the Second Empire had just been established under Napoleon III, and this was probably read as being anti-Republican. In 1864, in the final years of the Second Empire, the history painter Louis Duveau painted another unusual scene in A Mass at Sea in 1793. Persecution of Catholics became so severe that some took to practising their religion away from the view of Republicans, for their personal safety. Then, with the Franco-Prussian War in 1870, Napoleon III was overthrown and the Third Republic began. 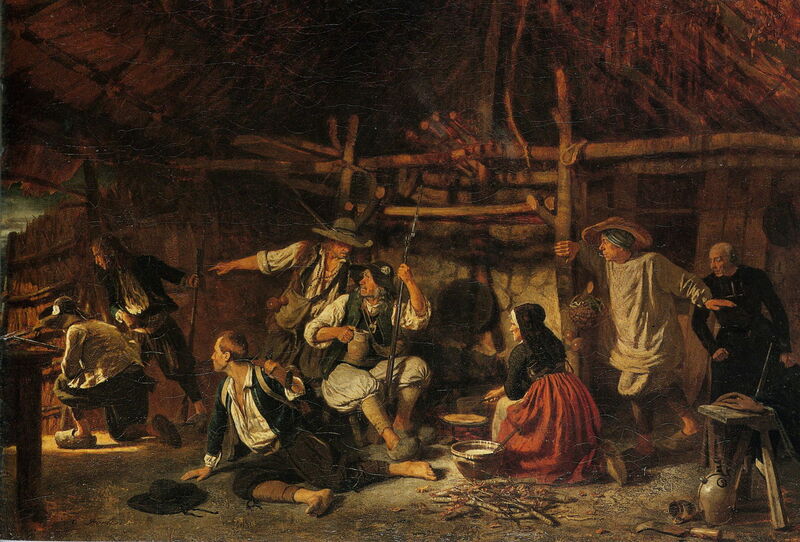 Victor Henri Juglar (1826–1885), The Spy, Scene of Chouannerie (1880), oil on canvas, dimensions not known, musée des Beaux-Arts et d’Archéologie de Châlons-en-Champagne, Châlons-en-Champagne, France. Image by Rama, via Wikimedia Commons. 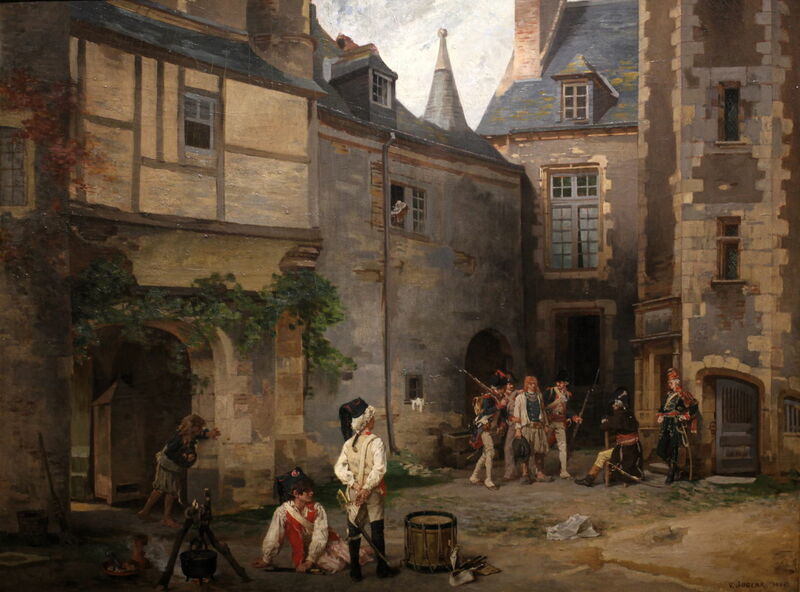 Victor Henri Juglar painted at least a couple of scenes from the French Revolution, of which one shows The Spy, Scene of Chouannerie, which he completed in 1880, when the Third Republic was a decade old. Curiously, its reading appears pro-Royalist, with some Republican soldiers arraigning an alleged Royalist spy before one of their officers, presumably prior to the firing squad. More overtly anti-Republican was Jean-Joseph Weerts’ return to The Death of Barra, also from 1880, which embroiders Robespierre’s propaganda still further. Weerts was Belgian by birth, but had studied and worked in Paris since 1867, painting history and religious works, including a celebrated view of the assassination of Marat. This painting was shown at the Salon in 1883, by which time events in the Vendée and to the north had become both common and highly popular. In the next and concluding article, I will show how, in the 1880s, this theme became so frequent at the Salon that critics had to ask artists not to paint them any more. Posted in General, Life, Painting and tagged Bara, David, Duveau, Fortin, French Revolution, Juglar, painting, Sorieul, Weerts. Bookmark the permalink.